This year, the Buckingham Palace State Rooms’ summer opening to the public has Royal Gifts as their theme. These are gifts that have been given to The Queen during her reign as part of the State Visits’ formal exchange of gifts. It is an opportunity for both countries to showcase their countries’ craftsmanship as well as to give something which they think the recipient will appreciate. 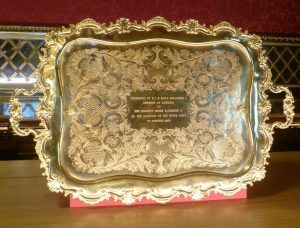 It’s a very large tray and it certainly impresses; the shine of the gold can be seen from across the room. 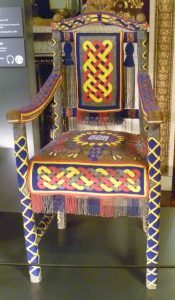 One of the earliest gifts in the exhibition is this beadwork throne ‘by the Yoruba people’ of Nigeria. It is one of a pair which was given to The Queen in 1956. I love the colour and the interlocking, almost Celtic-looking, knots. It’s a vibrant fusion of a traditional Western wooden arm chair and intricate beadwork, which signifies wealth and status in Yoruba culture. But presents to The Queen don’t have to be showy, as my next object shows. 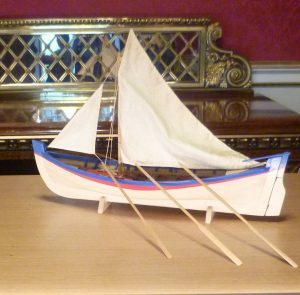 It is a model of a Tristan da Cunha long boat, 1:12 scale, and it comes with an inspiring story. The tiny British Overseas Territory volcanic island of Tristan da Cunha is the most remote island in the world. The nearest land is St Helena, 1200 miles away. In October 1961, a series of earthquakes and a massive landslide made it clear that a volcanic eruption was imminent. The 264 islanders had to evacuate in a hurry and, as our guide put it, ‘They rescued themselves in two traditional long boats.’ They sailed to a nearby uninhabited island and, from there, a Dutch ship took them to Cape Town; a Royal Marine ship was sent to bring them safely to Southampton. Most of them returned to Tristan da Cunha in 1963. This beautiful model of a ship, The Vessel of Friendship, was presented to The Queen by President Xi Jinping on the occasion of his State Visit to the U.K in 2015. 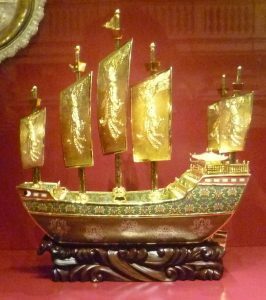 The ship, a model of the treasure ship of Zeng He of the Ming Dynasty, is made in bronze, gold, enamel and hardwood and there is a dove holding an olive branch as a symbol of peace on the prow. I’ve always liked dugongs, an Australian relative of the American manatee. Early sailors’ tales confused them with mermaids. They are peaceful creatures who ‘walk’ along the sea bed using their flippers, eating sea grass. They are classified as ‘vulnerable’ mainly due to the destruction and pollution of their habitat. So I was delighted to see that this carved model of a dugong, sculpted by Stephen Kawurlkku (1946-2009), was given to The Queen by the Governor-General of Australia, Sir William Deane, in 2000. I loved the traditional Aboriginal stylization of the dugong but with a 21st century twist. All the gifts given formally to The Queen as part of a State Visit automatically belong to The Royal Collection, and have done since Edward VII’s reign. 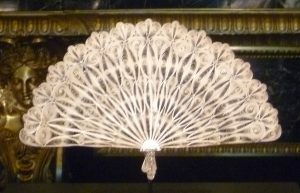 So the Queen has never actually used this pretty silver filigree fan, given to her by President Juan Carlos Wasmosy Monti of Paraguay in 1994. It seems a pity that so attractive an object should not get an occasional airing. 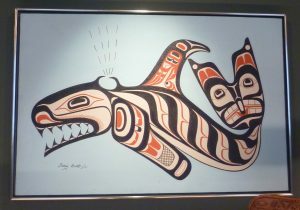 There are some beautiful and striking paintings among the collection of gifts in the exhibition, and I particularly liked this one of an orca, or killer whale. It was painted by Chief Tony Hunt (b. 1942) in acrylic on canvas. It was presented to The Queen by Chief Tony Hunt at the Museum of Anthropology, University of British Columbia, Vancouver, on the occasion of her Royal Visit to Canada in 1983. I love the orca’s vivid energy. Tony Hunt comes from the Kwakwaka’wakw family and the painting fuses traditional tribal art with modern materials. The Royal Gifts are thoughtfully and sympathetically displayed in geographical groups with plenty of space around them throughout the State Rooms. 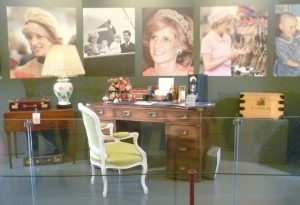 There is also a poignant selection of gifts that Diana, Princess of Wales received and a recreation of a section of her study with her desk and various objects. This exhibition is well worth a visit; I really enjoyed it. Oh, I love this. You’ve picked out some wonderful pieces, not necessarily rich in material but rich in sentiment and aesthetic value. Love the story of the longboat. I too have a soft spot for dugongs/manatees. Girl magazine when I was young had a South Seas story where someone calls out “manatee” and I’ve never forgotten it (have a later copy of it in a revived annual). Only later did I learn the dugongs are their counterparts and that they’d been mistaken for mermaids. Also love their other name – sea cow! They are gentle creatures and that carving is delightful. Delighted to find a fellow dugong fan! I was particularly pleased to see that Aboriginal/tribal art, which was once dismissed as somehow less worthy of inclusion as art, is well represented. There were two wonderful Inuit sculptures of a hunter and a polar bear, for example. The Queen has undertaken more than 250 overseas visits during her reign, and the variety of gifts she has been given is a credit to human creativity. It was all very cheering.